Surveillance video from a Brooklyn store shows New York police officers brutally beating a suspect who is holding his hands up and apparently trying to surrender. He was arrested on charges of stealing $3 worth of pizza from a nearby shop. 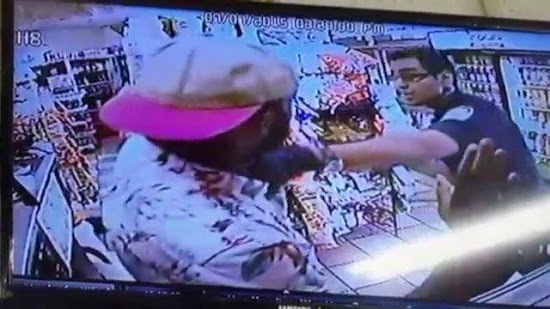 Obtained by the New York Daily News, the video from Raslin Grocery in Bedford-Stuyvesant shows one officer punching the man, identified as 24-year-old Thomas Jennings Another officer is hitting and prodding Jennings with a nightstick. “I didn’t ever know it was coming,” Jennings, told the paper. He said he suffered a cut above his eye that required five stitches. According to court documents, on July 7 officers Pearce Martinez and Lenny Lutchman were responding to a call from New York Fried Chicken on Saratoga Avenue, saying that Jennings and another man fled after not paying $3 for two slices of pizza. Jennings says he was a dollar short and went outside to borrow some money. His friend, who was not identified, reportedly brandished a switchblade and said the men had no intention of paying for the food, before running away. Officers tracked Jennings down to the nearby bodega, where the incident shown on the video took place. The video shows officer Martinez running up and punching Jennings. Lutchman then jumps on Jennings, hitting his back with a baton.